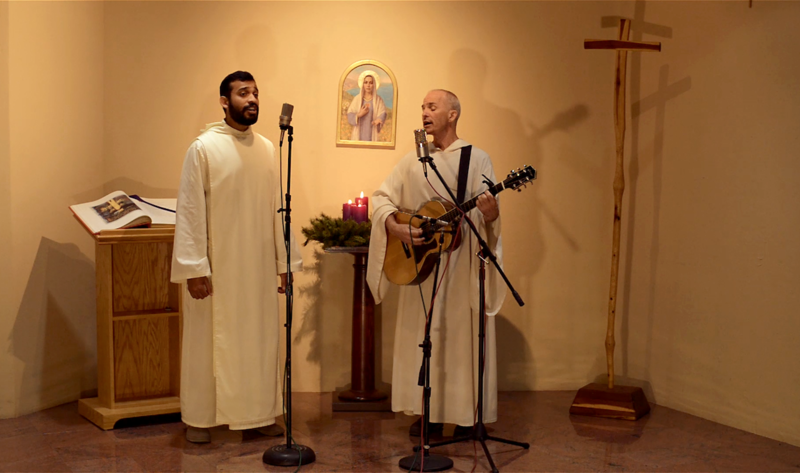 A musical offering for Christmast 2014, of "Every Stone Shall Cry", performed by Father Cyprian and Brother Cassian at New Camaldoli Hermitage in Big Sur, California. Cyprian first wrote this piece in the 1980s and recorded it in 1994 on his album Behind and Before Me, but wanted to do a simpler live version, this time with Brother Cassian. It is a setting of a poem by Richard Wilbur called "Christmas Hymn." Cameras: Panasonic GH4 and Nikon D600. Nikon lenses. All natural light except a tiny LED fill light and overhead room spots. Mics: Neumann KM184's on guitar, Neumann TLM103 on Cassian's Vocal and a Lawson L251FET on Cyprian's vocal. Recorded into a Presonus Firestudio and Macbook Pro running Pro Tools.